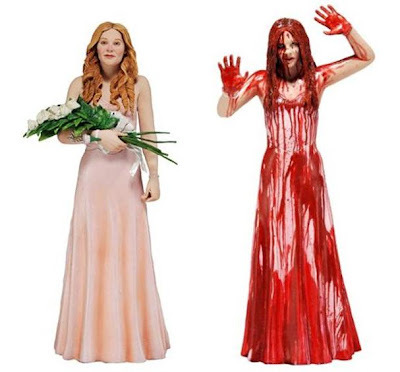 She's Fantastic: NECA's CARRIE WHITE (Prom Queen Version)! I think this figure looks great. Like I mentioned before, the likeness to Chloë Grace Moretz is not very good, but the overall look of the toy itself is very beautiful. This figure has one point of articulation - her head. Luckily her hair is soft so at least it's functional. Here are a few stills from the film. It looks amazing. So NECA released two versions of this figure. The pig-blood version is clearly the more iconic Carrie White design, but my regular readers will know that I get very squeamish over gory toys. I've seen the bloody version in stores though and she looks terrific. My Carrie has a black smudge on her cheekbone that I didn't notice in the packaging. Other than that the paint was flawless. I had no idea there was a new movie coming out! I really like Chloë & Julianne Moore too. The figure is quite nice. I thought she would have a bit more movement. Does she have legs? Yeah the movie snuck up on me too. Julianne Moore was being interviewed on the radio recently and it was mentioned... then all the things clicked into place: the toys, the Carrie halloween costumes, etc. Yes, she has sculpted legs and very detailed feet and shoes, but they are not visible unless you look up her dress. And they aren't articulated at all. Only the neck. It looks like the bloody version is the same way because I can't see any joints. this are nice and might get them. But im far more interested on Juliann Moore. I dont think she has an action figure (Jurassic Park perhaps?) but i woul kill for a Sissy Spacek figure, and Piper Lauire of course, with voice chip saying: "they will all laugh at yah". I think it's an unfortunate headsculpt that looks more like Julianne Moore than it does Chloe. The best part is that this probably made from a 3-D scan of her face. That's just an assumption on my part, but from everything I've read that's kind of become a standard for "celebrity" figures. Folks, sometimes high-tech isn't always better. The Baroness Rise of Cobra action figure which was made using a scan of Sienna Miller's face was also pretty funky, though that was at a smaller scale. And let's not forget all the Harrison Ford figures out there... there are hundreds, but only a select few look like him. Harrison's is a notoriously difficult likeness to pin down indeed! I've gotta say I'm really liking the headsculpt on Hasbro's six-inch scale Black Series Han Solo. I hope you'll feature Slave Leia from that line on here soon! I just photographed Leia this weekend. Her sculpt is pretty much perfect. I think I'll post her review on Friday. I'd make it sooner but I have a few already written and the New52 Harley figure comes out Wednesday so I'll be excited to review her asap. I found the leia figure very early (mid/early December?) and I probably could have had one of the earliest reviews on the web, but I was very busy and didn't get around to it until now... shame on me.